← RECOMMENDED: Giesta, 2009 Red Blend (Tinta Roriz [Tempranillo] 45%, Touriga Nacional 32%, Jaen 23%), Dão, Portugal. 13% ABV. $12.99 from www.wsjwine.com, $100.08/case of 12 from zagatwine.com. This year I’m making just two selections: My favorite wine of the year, and the best-value wine of the year. Please note that my selections are based only on wines I personally tasted (just a few hundred). The Frugal Wine Snob Wine of the Year: J.L. 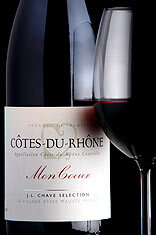 Chave 2007 “Mon Coeur” Côtes du Rhône. Nose and taste of Stargazer Lilies, just delicious. (See review here: http://www.thefrugalwinesnob.com/?p=81) However, since it’s no longer available, here are two selections that are similar: the Marques de Riscal 2005 Rioja Reserva (http://www.thefrugalwinesnob.com/?p=20) and Château La Bonnelle 2008 Saint-Émilion Grand Cru (http://www.thefrugalwinesnob.com/?p=881). 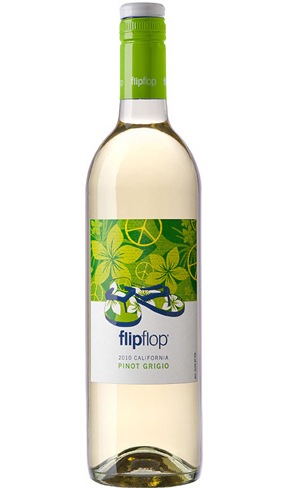 The Frugal Wine Snob Best Value Wine of the Year: Flipflop 2010 Pinot Grigio, California. (See review here: http://www.thefrugalwinesnob.com/?p=438) This wine has been a huge surprise and a pleasure. Utterly delicious and refreshing, this is a wine we’ve served to dozens of people—and everyone has liked it very much or loved it, from inexperienced wine drinkers, to “I don’t like Pinot Grigio” peeps, to people who love Pinot Grigio. At $4.99/bottle, this is a fabulous choice for an everyday wine, a refreshing after-summer-outdoor-work wine, and for parties. I’m looking forward to this year! Thanks to all of you for your recommendations. We’re “on it” and will enjoy reporting on new wines and new vintages this year. Absolutely love The St. Emilion 2008 La Bonnelle Grand Cru. Where can I get more? I bought out the local ABC stores. Jeannie, I don’t know! I used wine-searcher.com and came up with a location in the U.K. Can your ABC store special order it for you? Depending on what state you are in you can buy it from a PRP wine consultant for $40/bottle but they are only in 8 states.